Beyond the stunning Bay views, there are beautiful, unique elements of art and design all around us. But do Marin locals know who made them? We’ve all spotted Heath Ceramics but most unique design gems remain a mystery. Wescover reveals the designers and artists behind everything in restaurants, hotels, cafes, and public spaces— in Marin and around the world. Now when we spot something we love, Wescover helps us discover more, dive deeper, and meet local artists, designers, and craftsmen. Professional interior designers use Wescover to find new artists and source the latest styles and now you can too. More and more locals come to Wescover to discover and connect with new creative communities. Here are some design gems hidden among some of Marin’s most well-known destinations. Farmshop may be known for culinary creativity but they've also celebrated artisan design producers. Their local eats come served on ceramic tableware by artist Delphine's Humble Ceramics. Surrounded by a custom photo mural sitting on carpenter-made furniture, these rustic-modern dishes are another local layer to your meal. Ceramic tablewares by Humble Ceramics in Farmshop, Marin, CA. Well known throughout the San Francisco Bay Area, Heather Day took a break from producing her coveted canvas works to paint this original mural. The piece splashes across the walls bringing movement to this Sausalito beer hall. Typically crawling with kids, this set of sculptures came from the shop of Evan Shively: former chef, wood artisan, and local lumber legend. Evan's yard, mill, and showroom are a valued resource for the bay's top craftsmen and designers alike— and have gone into famous spaces like the MOMA's restaurant In-Situ. Evan Shively and Arborica's Eucalyptus Sculptures in Marin Country Mart, Larkspur, CA. Casa Madrona's stunning redesign by Salt + Bones included a new art collection featuring work by local Sausalito abstract painter Sharon Paster. In a perfect compliment to the space's refresh, her blue oil pigment series explores the potential for movement and change. 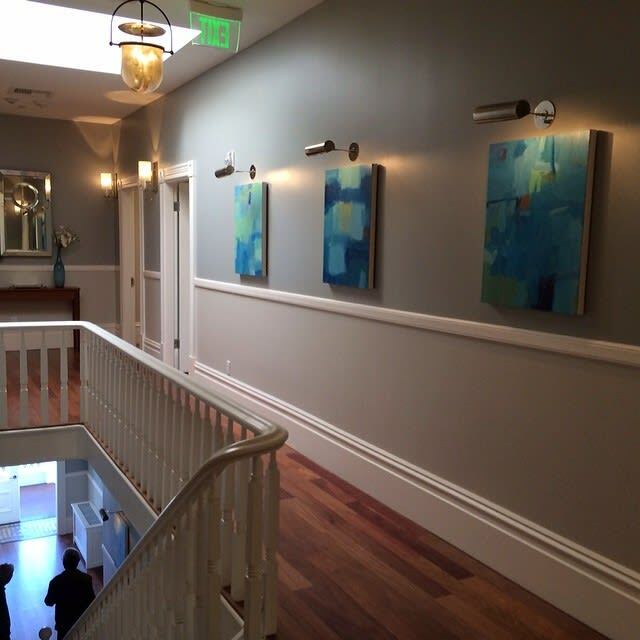 Abstract Paintings by Sharon Paster in Casa Madrona Hotel & Spa, Sausalito, CA. See how Christina Watka installed the hundreds of handmade ceramic tiles that make up the latest addition to this Sausalito hotel. Her large-scale installations capture dynamic patterns found in swarms, flocks, cells, constellations, and topographical maps. "You need to be surrounded by things you love, or that stimulate you in some way." Murmuration Series by Christina Watka in Casa Madrona. There are more spaces to discover in and around Marin! Whether you’re working on a home re-model, a professional interior designer, or just design-curious, come to Wescover for design inspiration that always leads back to the original designer. Keep Exploring design inspiration on Wescover.